World leaders, business tycoons, self-made billionaires -- it might seem like their biggest worry is whether to take the helicopter or the jet, but it turns out that many of the planet's most successful people make a habit out of worrying. Or more to the point, they form habits to tone down their worries. And unlike most people, powerhouses such as Bill Gates, Oprah Winfrey and Jeffrey Bezos don't include money on their list of top worries. Check out what these 12 leaders spend their time stressing over and the habits they put in place to quell their worries. It might just help you develop a money-winning habit of your own. With a net worth of about $70 billion, you'd think that one of the richest men on the planet would have a building full of people reading things for him. But it turns out Buffett credits much of his success to putting in the hard yards in the knowledge-gathering department himself. At the Columbia University School of Business, when asked for the biggest key to success he could share, Buffett held up a tower of reports and trade publications and said, "Read 500 pages like this every day." "That's how knowledge works," he said. "It builds up like compound interest. All of you can do it, but I guarantee not many of you will do it." Perhaps that's why he ranks passion as a major focus. "I feel like in a world where we all try to figure out our place and our purpose here, your passions are one of your most obvious guides," he told Forbes. Sounds like a license to hit the surf. The founder and CEO of Amazon, and self-proclaimed nerd, built his empire because of what he labeled the regret minimization framework. That's nerd-speak for worrying about regretting not going for it. This approach helped him when he had a successful Wall Street career but wanted to quit and do something "crazy" like selling books online. His boss advised him not to. But Bezos imagined himself as an 80-year-old man hoping that he had minimized regrets. "I knew that if I failed, I would not regret that, but I knew the one thing I might regret is never having tried," Bezos told the Academy of Achievement. Thinking about it that way made the decision incredibly easy for him, he said, and the results have proven out his theory. Cuban told Entrepreneur.com that business is his morning meditation. Specifically, that means checking his Cyber Dust messages -- a messaging app he created that doesn't leave a permanent record -- followed by work emails. He worries that ignoring those for less vital tasks could kill his winning smile, not to mention his winning formula. 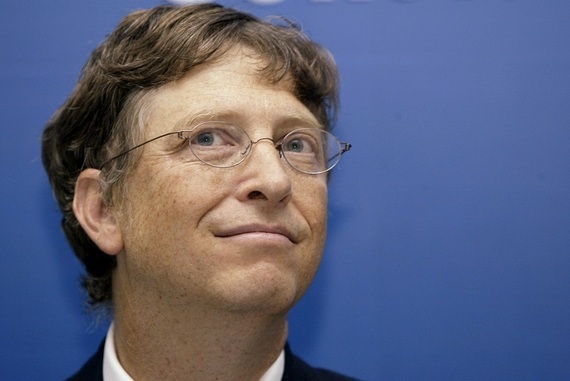 Like Buffett, the richest man in the world, Bill Gates, also is a veracious vacuum of knowledge, reading newspapers, reports and more every day. But when he was CEO of Microsoft, he worried a lot about having the alone time necessary to step his reading up a notch -- or 10. Famously, he took a week a few times a year and disappeared to a secluded cottage where he would read everything he could get his hands on, sometimes for 18 hours a day. No wife, no visitors, no phone or email, and no distractions. He called it "Think Week." Obviously, retreating from society a few weeks a year is a bit tough for most people, but the theory is solid: Grab some quiet, alone time and brainstorm for success. One of only five black CEOs of the largest companies in the U.S., the CEO and chairman of American Express didn't get to the top without talent, brains ... and worrying. Specifically, he makes sure that any worries about the next day are taken care of -- or at least scheduled to be taken care of -- the night before. Depending on whom you ask, Carl Icahn is either a corporate raider or an investor's dream ally. But with a net worth of $21.8 billion and a Buffett-bettering return rate of 30 percent for his investors, Icahn is clearly worrying about the right things. And one of them is sitting on the sidelines watching company waste go unchecked. In fact, he is so famously -- or infamously -- aggressive in the companies he buys stock in that companies used to pay him "greenmail" just to go away, according to "60 Minutes." But Icahn insists that betting big and getting involved every day is the road to billions. With a net worth of $3 billion, self-made billionaire Oprah Winfrey is as wealthy as she is popular. According to her, that's because she doesn't make worrying about earning money number one on her stress-o-meter. Instead, she worries about something much more precious to her. "What I know for sure is that if you want to have success, you can't make success your goal," she wrote in O, The Oprah Magazine. "The key is not to worry about being successful but to instead work toward being significant, and the success will naturally follow." Whether you like President Obama or not, it's hard to deny that attaining the highest office in the land is a sign of massive success. So, just what does the leader of the free world worry about when not stressing about peace in the Middle East or the cost of gas? Suits. That's right. To reduce low-level decision-making, he said he wears only gray or blue suits. "I don't want to make decisions about what I'm eating or wearing because I have too many other decisions to make," he told Vanity Fair. "You need to focus your decision-making energy. You need to routinize yourself. You can't be going through the day distracted by trivia." Donald Trump does a lot of things but thinking small is not one of them. And that's by design, according to the presidential candidate with a net worth of $4 billion. Whether it's buildings, buyouts or bragging, The Donald always goes big. "As long as you're going to be thinking anyway, think big," Trump has said. Tony Hsieh -- the founder and CEO of Zappos who has had success with a few major companies and is now trying to transform Las Vegas into a tech hub -- isn't too worried about money. Maybe that's because he's much more worried about not having fun -- while making money. "Have fun," the boy wonder told Inc. Magazine. "The game is a lot more enjoyable when you're trying to do more than just make money." Well, a guy who's put more than $300 million into reinventing downtown Vegas should know. It's probably safe to say that billionaire jetsetter and Virgin Group founder Sir Richard Branson, worth $4.9 billion according to Forbes, has never been accused of being boring. He makes it a point not to be. In his Live Mint column, for example, he once wrote about his goal of making every day unique. Branson wrote that while many people find routine helpful, he finds it limiting, and he confessed to purposefully not having a routine. "As an entrepreneur you have to find a way to be flexible, because if there is a problem, you need to be able to prioritize," he wrote. So try cutting the routine and perhaps your ideas will soar as high as Sir Branson's have.